Hey there, I’m Shruti – aka ArtsyCraftsyMom . I have always loved activities for children that involve fingerpainting. Kids love getting involved, getting messy and creating works of art! 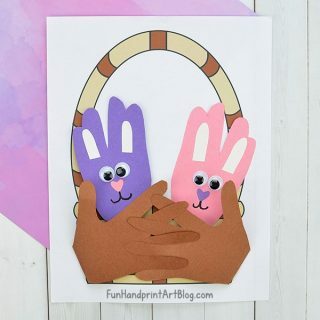 Handprint art, footprint art and thumbprint art also make amazing gifts and are a super fun kids activity. Don’t you think so? 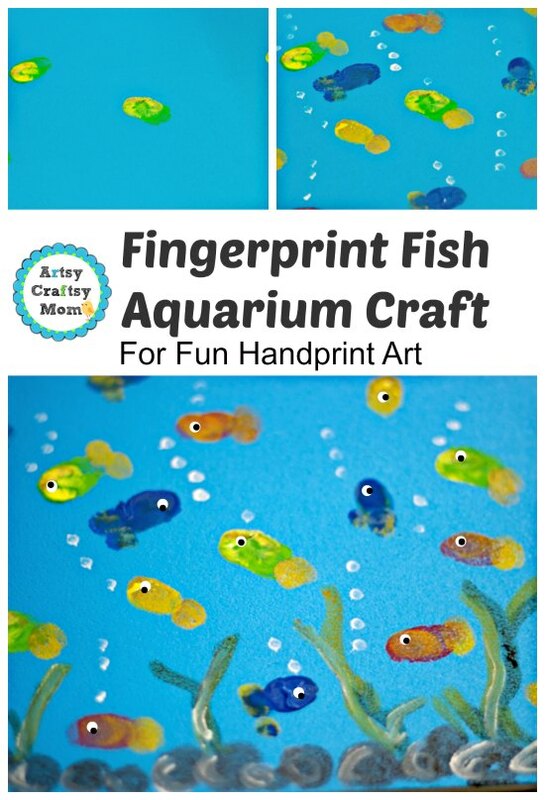 Today I’m sharing a super simple and very popular activity of mine – our fingerprint fish aquarium craft! You can use a blue construction paper or paint a white paper blue. Decide how many fish you are going to paint..
Dip your thumb in the lightest color first – in our case it was yellow. Ensure that the paints are not drippy and then place thumbprints across the breadth of the page. Wipe with a tissue and start with the next color. You can mix two colors and create a shaded fish too. 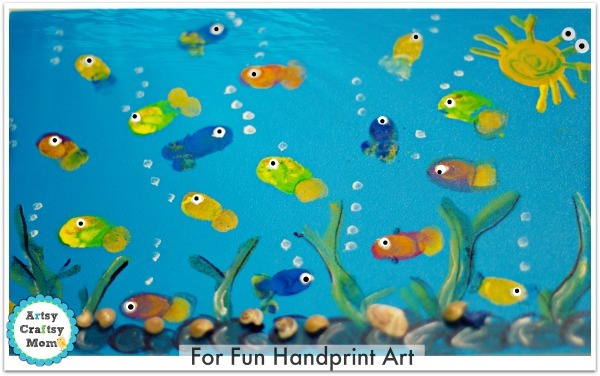 Once all the fish are printed on the paper, dip your forefinger in paint and print the tail. While this dries, use thumbs or fingertips dipped in black paint to make rocks at the bottom of the aquarium. Use green paint draw few aquatic plants while being careful to not overlap any fish. Draw a fingerpainted crab by making a big circle like we did. Using a cotton bud dipped in paint to draw the crab’s legs , claws, and eyes. Finally, use a black marker to draw a dot for the eye and outline the stones for added effect. You can optionally stick some shells or decorative stones at the bottom of the page to give a 3D effect. What do you think of this simple aquarium craft? 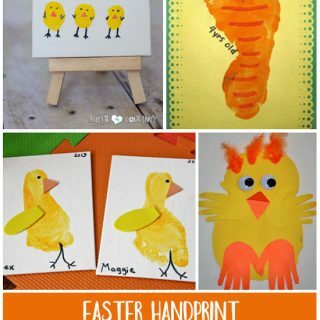 You might also be interested in checking out our other handprint crafts – Handprint Chicken with Chicks craft and Thumbprint Honey Bee & Hive craft. Drop by and let me know what you think! Thanks Amanda for having me here!